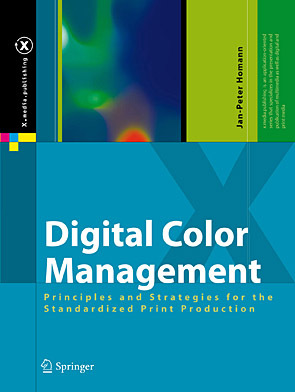 The book describes color management for print production with a focus on implementing standards for separation, soft proof, contract proof, data delivery and printing. The basics and strategies are targeted at setting up vendor-independent color management workflows which can easily be implemented using leading applications. Utilizing a unique graphical concept, I explain how different standards and specifications such as ISO 12647, SWOP, GRACoL, G7, ICC profile format and PDF/X fit together. I describe the main points for setting up color management and quality control from the perspective of print buyers, photographers, agencies, pre-press and printers. The book has a strong focus on communication between all of these essential players. Based on the best practice in communication it explains the most important steps for quality control for digital data, contract proofs and prints. The described strategies are the result of 15 years colormanagement projects with some of the leading print buyers, pre-press houses and printers in Germany and Europe. The English edition adapts these strategies also for the US market according to G7, GRACoL and SWOP. As a reader of this book you can register as a user and ask questions via the comments functions of the website. ” This excellent book, now available in English for the first time, offers insight and practical advice on all areas of ICC color management. As well as offering detail on the application of ICC color management to graphic arts workflows, it gives an background to color theory that even the most experienced users in this area will find useful. Paul Sherfield who runs The Missing Horse Consultancy is well known in the UK printing and pre-press industry as having considerable knowledge on digital workflows, with a special expertise on the business reasoning behind such systems. He has installed some of the most successful digital pre-press systems in the UK. For 2 years he worked on a number of medium term projects before starting the consultancy in July 2000. Before this he was a partner in what became one of the leading pre-press/printing companies in London. He is active in a number of industry groups and is a regular speaker at seminars and conferences. At december 2008, some descriptions from the publishing house at Amazon sites are referring to the second edition of the book and are outdated. I am surprised, that author of this book never mention EFI. i like to what is reason? EfI is (now) mentioned with Links to ColorProof XF and the Color Verifier on the start page. Please see also further information on calibration and profile optimization at proofing. Calibration should be bring the proofer for a defined media / ink combination to a “gold standard” defined by proofing system vendor or by the user. If the proofing vendor delivers devicelink profiles optimized for simulating printing standards like FOGRA / PSO, GRACoL, SWOP on a calibrated system, the user has to do the calibration ONCE (!!) and all printing standard simulations are spot on. The currenty available optimization in Efi Colorproof – so far as I know – has to be done for every combination of printing standard and ink / media combination. If on a proofing system with a semimatte medium three printing standards are simulated, the optimization in EfI Colorproof has to be done for all three combinations. what does does “Praxisband”, which is mentioned several times in the german edition of your book refer to? is it another book? Writing the third edition, I had the plan to publish a second book with step by step “recepts” for colormanagement to implement ISO 12647-2. But as such book would need screenshots of about 20 differnt software solutions, a printed book would be outdated very fast. For the 4. edition there will be no “Praxisband”. can you indicate sources about the mathematical background of color management, especially DeviceLink generation?